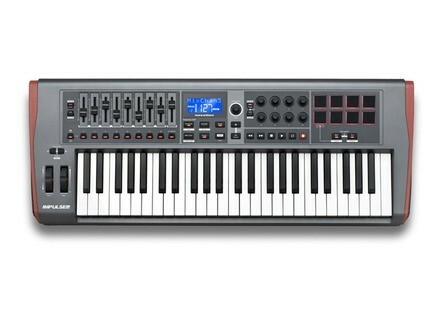 Impulse 49, 49-Key MIDI Keyboard from Novation in the Impulse series. Novation has announced Impulse, a range of USB/MIDI controllers. They each have a keyboard and a control surface powered by a new version of Novation’s Automap control software – Automap 4. Impulse also has 8 back-lit drum pads which can warp arpeggios, roll beats and launch clips in Ableton live. Control surface gives you control of your DAW including mixer, transport and plug-in instruments and effects. Back-lit drum pads allow you to warp arpeggios and improvise with rhythm patterns – they also launch clips in Ableton. LCD screen displays control information. Comes with Ableton Live Lite, Novation’s Bass Station synth and a Loopmasters sample pack. USB powered, with expression and sustain pedal inputs as well as MIDI in and out ports for connecting external MIDI instruments. The Impulse will come in 25, 49, and 61 keys editions. Pricing and availability TBA. For more information, visit the Novation software. Universal Audio Ampex ATR-102 Universal Audio announces that the Ampex ATR-102 Mastering Tape Recorder is now available as a faithful plug-in emulation on the UAD-2 Powered Plug-Ins platform. Novation Automap 4 Novation has announced Automap 4, the latest version of the control software that powers Novation controllers. Variety Of Sound BaxterEQ Variety Of Sound has released more details on BaxterEQ, a transparent mastering and mix buss shelving EQ plug-in for Windows.